I really, really, really enjoy Kristi's writing style. Her books are engaging, and her characters are realistic and emotive. This new series starts out with a bored earl-to-be who, after meeting an out-of-place woman at a ball, is challenged to make a difference in the lives of forgotten children. These forgotten children are illegitimate, which may or may not make you uncomfortable. Kristi is very tasteful in her descriptions, but the whole book does deal with the difficult, historic subject - of children born out of wedlock and the beginnings of informal adoptions. I loved seeing Jess in this story (the spy turned maid from the Hawthorne House series)! I hope Kristi is going to tell her story next!! I am so curious as to how she ended up at Haven House! 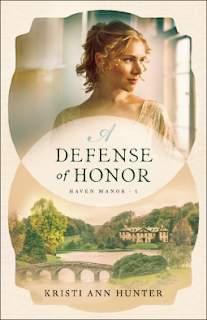 If you've read Kristi's past books, you won't want to miss A Defense of Honor!